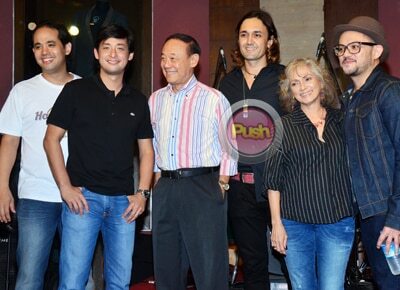 Generation band launches their self-titled debut album this month under Star Records. Formed in 2008, new rock band Generation is composed of the offspring of legendary Filipino recording artists. Members Joe and Mike Chan are sons of balladeer Jose Mari Chan and play bass and keyboards respectively. Kowboy Santos, son of rock singer Sampaguita, is on lead guitar. Ige Gallardo, son of Celeste Legaspi, plays rhythm guitar. The foursome started performing in various gigs playing classics from The Beatles, Doobie Brothers, and Cars, among others. They admit that it was not at all planned that they would form a band when they first met. “Magka-classmates kami nung high school tapos naging kapitbahay ko si Kowboy sa Paranaque, dun kami nagkakilala tapos nag-jamming na kami. We became friends muna bago kami naging banda. Nagkataon lang na magkasundo kami talaga. Nakaka-relate kami, shared experience kumbaga. Hindi naman namin plinano na magbubuo kami ng banda na lahat anak ng musicians. Nagkataon lang na ganun ang nangyari, natural lang. Tinuloy na lang namin,” Ige said during the launch of their self-titled debut album Generation under Star Records last July 23 at the Hard Rock Cafe in Makati City. Kowboy Santos admitted that his mom Sampaguita was happy to see him embark on the same career. “We're just proud to continue the legacy of our parents and represent them and of course ourselves, too. We want to continue the music. My mom is proud of me and she thinks the stars aligned for this to happen. She's very proud of what I've done. I've played for my mom, too. I was her guitar player. She's always wanted this for any one of her kids. Who wouldn't want their kids to take over the legacy? I just want to represent her the best way I can and rock as had as possible. It becomes bigger than that when you really think about it. Music is pretty much all our common denominator so I feel proud to be carrying it on,” he admitted. As the youngest member of Generation, 39-year-old lead guitarist slash vocalist Kowboy shared that his top musical influences growing up were Eric Clapton, Jimi Hendrix, and Led Zeppelin. “Those guys are pretty much what inspired me to pick up the guitar. Basically the concept of our album is we each have three songs there. We sing three songs each and we just kind of supported each other there. We composed all our songs. We recorded sa iba ibang studio, iba iba din yung drummer namin,” he added. Although they only decided to launch their debut album this year, Kowboy said that individually the group has been immersed in music for a long time already. “Actually matagal na akong umikot sa mga bars and I do session work in the studio. I've been playing live since I was in my twenties. Bakit ngayon lang? Kasi I think when we joined forces it was much more of a powerful force to reckon with than if we were to do it alone and solo, they would always compare us to one parent. As a child of an icon that might not be fair sometimes,” he shared. What sets apart Generation from other local rock bands is not just their lineage, but their talent when it comes to writing and performing music. “First of all, wholesome kami. Apat kami na singer, apat kami na songwriter. Nag-ha-harmonize kami ng four-part vocal harmony sa mga kanta namin and mga parang new generation ng mga OPM icons. Tapos nagsama kami lahat. I mean puwede naman kami mag-solo career eh. Si Mike may album na yun eh pero para sa amin hindi meant eh. Ito yung meant eh. Na-feel namin lahat na ito yung dapat naming seryosohing ilabas,” Kowboy explained. The Generation album is now available in record bars nationwide for only P250. Their tracks can also be downloaded via iTunes, Amazon.com, MyMusicStore.com.ph and Starmusic.ph. For more generation about Generation, visit Star Records Facebook fan page and follow @starrecordsph on Twitter.